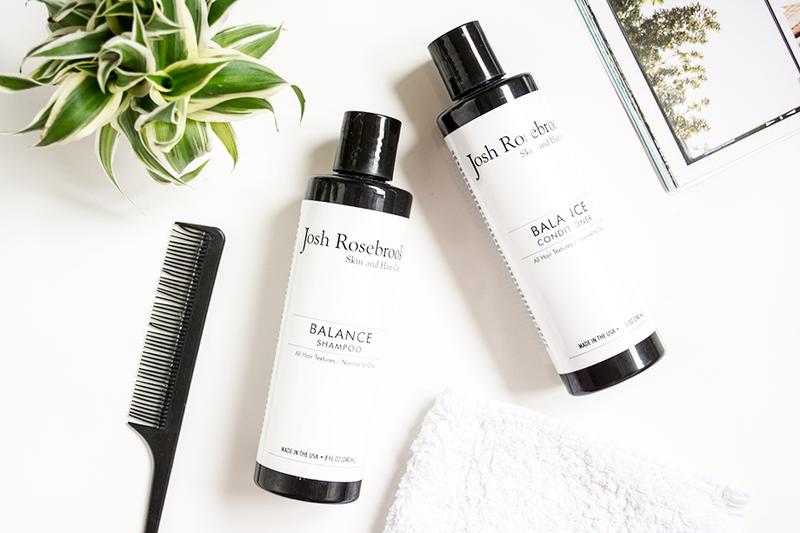 After my first experience of Josh Rosebrook's haircare products over a year ago, I was intrigued to see if the more recent Balance Shampoo & Conditioner would work for my hair. I decided to pick these up in November's Beauty Heroes box as it worked out much cheaper than buying the products individually here in the UK. I'd read some rave green beauty blogger reviews so had high hopes, but I'll cut straight to the point and say unfortunately this duo just didn't live up to the hype for me! I've persevered with these products for a few months now (just in case my hair needed some time to adjust) and I've had mixed results. As the name suggests, the shampoo is designed to have a balancing effect on normal to oily scalps. It has a low lather, so you need to divide the hair into sections (top/back/sides) to properly distribute the product over the whole scalp. I find it easiest to emulsify in my hands first before applying to get a few more suds and leave for a couple of minutes before rinsing. The main problem I have is that it rarely leaves my hair feeling totally clean, even with repeating again after the first rinse and experimenting with different quantities. I did a bit of research as to why this could be and apparently living in a hard water area, like I do, can impact the performance of natural shampoo. I do have a shower filter though, so I guess I must just be one of only a few that unfortunately doesn't get along with this particular shampoo! The conditioner, on the other hand, works a lot better than the shampoo for me in terms of performance. It softens, adds shine, reduces frizz without weighing my hair down and I've noticed less breakage too. The only thing is that I really dislike the scent. I'm usually happy with most herbal scents, but there's just something about this particular blend that doesn't appeal and my other half even comments on how it makes my hair smell (of course that sort of thing is completely subjective though)! The price tag of £31 a bottle is also a bit steep for my budget, but if you're interested in trying Josh Rosebrook's products you can find them online in the UK at abeautifulworld.co.uk. Have you tried any Josh Rosebrook haircare products before?